Carlton arrived in Perth ready to take on Fremantle; determined to win to keep their hopes of finishing in the top two alive. They would probably not admit to thinking a big win to boost percentage would be a bonus. In the five rounds to date the winless Dockers have scored 17.30, while the Blues have kicked 29.23. Missed opportunities have wrecked the home team’s season. The WA Women’s Football League launched the 2017 season this week and key contributors celebrating 30 years of the WAWFL formed the purple guard of honour. The Dockers ran through the banner (Ready to Soar with the Purple Army Roar) and did not stop running until the siren ended the first quarter with Fremantle 3.0. (18) to Carlton 0.2. (2) What?! The home team kicked straight and true through Stacey Barr, Lara Filocamo and the indefatigable skipper Kara Donnellan. The Blues marquee star Darcy Vescio missed a shot she would usually slot but her marquee mate Brianna Davey was her usual brilliant self in defence. Alicia Janz, elevated to the injury riddled Fremantle list last week, showed great promise in the ruck in her just her second game. The Dockers threatened to add to the lead early in the second quarter but the Blues fought back through strong defence and the decisive ball use of Davey, Gabriella Pound and Katie Loynes. The AFLW leading goal kicker Vescio scored yet another clever goal, her first of the game, before first gamer Jordan Ivey snapped a neat goal from 40 metres to reduce the margin to four points. The Dockers pushed into the forward 50 and despite her best efforts, Davey gave away free kicks for pushing and holding, the latter resulting in a goal to Ebony Antonio from 20 metres out and straight in front. Carlton answered quickly with Vescio’s second goal from the goal square, making the most of the spill from a questionable attempt to spoil Bianca Jakobsson by Talya Bresland. At half time in a hot game Fremantle 4.0 (24) led Carlton 3.2 (20). Early in the third quarter Gemma Houghton took a great contested mark in the forward line but couldn’t convert. Repeated attacks into Fremantle’s forward 50 did not produce a goal but the Blues failed to make the home team pay with missed opportunities to the dangerous Loynes at the City end. Kira Phillips missed a chance to finish a great chain of long kicks and clean marks but the signs were looking positive for Fremantle. Ebony Antonio and Donnellan were leading the way with fierce tackling and repeated efforts to contest. The visitors lost defender Danielle Hardiman through injury and made some telling errors in kicking out from behind. Houghton’s intercept mark and goal stretched the lead to 13 points with three minutes left in the quarter. Carlton cleared from the restart of play and Vescio kicked a crucial goal to keep the Blues in the contest. With a lead of just eight points at the start of the term, I was determined to clear my mind of last week’s one point loss to Collingwood and the draw with GWS in round three. Determined. The opening few minutes of the last quarter saw tackle after tackle after tackle. Fremantle appeared to have the better of the contest and when another wayward throw in from the boundary umpire on the members wing was forced forward by Houghton, it found three Dockers contesting with two Blues. O’Sullivan, Donnellan and Barr squeezed Tahni Nestor and Laura Attard off the ball and Barr kicked to the open 50. Amy Lavell ran on to the ball, gathered the awkward bounce and handballed to the skipper running past her. Donnellan had bounced back from the previous contest and sprinted the 40 metres to be in the best position to receive the pass and take the shot on goal. Davey made a desperate attempt to smother but couldn’t affect the kick. Goal! The only goal of a super tight fourth quarter. At the half way point of the the last quarter, Fremantle held a 14 point lead. Exhale. Barr and Phillips added behinds to extend the lead and the Blues did not hit the scoreboard at all in the last term. 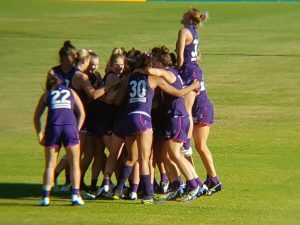 The Dockers won their first AFLW game and sunk the Blues hopes of reaching the Grand Final along the way. Heave Ho! 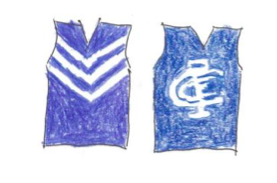 OUR VOTES: Donnellan (Fremantle) 3, Antonio (Fremantle) 2, Davey (Carlton) 1. Crowd: my girlfriend and the players’ families. It was 3pm Friday! I'm a rusted on Fremantle Dockers supporter. Radio is my first love, followed closely by cricket. I coordinate the Broadcast Journalism Diploma at Swinburne University of Technology in Melbourne. Thanks for your articles Danae. I have been to all the girls’ home games EXCEPT THIS ONE! Devo.. So glad they got their first win, and as a bonus the boys followed suit. No arguments about which team deserved to win that game Danae. The Dockers called the tune most of the afternoon. Lorri, your absence wouldn’t have been related to being at work, by any chance? Ridiculous scheduling for this game.